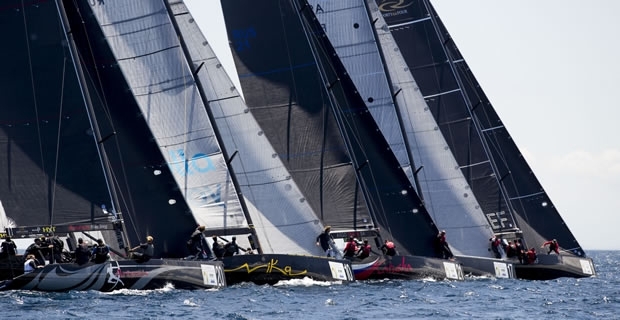 Ostensibly Sotogrande, home of the 2016 RC44 World Championship, threw up perfect conditions for the penultimate day of the competition. But, once again, it was shifty in extremis, with the wind generally lighter. As a result, none of the 11 international teams were impervious to high scores. The wind picked up to 11-18 knots during the first race, shifting between 280 and 310° with the sea breeze later attempting to push the wind angle left, before the wind dropped for the day's fourth and final race. Stand-out performer, as on day one, was Igor Lah's Team Ceeref, which claimed today's first two races. The Slovenian team followed this up with a fourth place, but picked up a penalty in the final race from which they could only salvage an eighth place, having at one point been last. Igor Lah praised his crew and admitted that the final two races had been "really tough. We made a mistake in the last: We tacked too close to Artemis so we had to do a penalty. But that happens. The third race was also tough because on the first downwind we had different wind than the boats behind us – so that was tricky." And going into the last day – how is he feeling? "Good, really good! We just have to perform like we did today." Yesterday's leader, Peninsula Petroleum of event host, John Bassadone, also started confidently, but ended the day with two uncharacteristic big scores. The net result is that going into the final day, Team CEEREF leads, but by a mere five points. Team CEEREF's British tactician Adrian Stead mused: "Igor did a great job. But today showed that everyone is sailing really well and is really difficult to get past. We'll wait and see what tomorrow brings." With three races scheduled for the final day and lighter, more fluky conditions forecast, there is much work still left to do. In theory any of the top seven boats could still win the RC44 World Championship Marina de Sotogrande. Seeming to prefer today's conditions was Artemis Racing, skippered by Torbjörn Törnqvist, which won today's third race. With a 5-6-1-2 scoreline, the Swedish team came close to being 'boat of the day', scoring just one point more than Team CEEREF. Törnqvist seemed pleased: "It was very shifty, but we were lucky with the shifts and in the two last races we did most of the things right. It's good to finish like that. "The wind was up and down, which was difficult, but there were great conditions and as the day went on most people found the pattern of the race course. It was great racing." As usual here off Marina de Sotogrande, the big shifts require profound foresight by tacticians and crews able to change gears instantaneously to respond to the ever changing conditions. Artemis Racing's tactician, Francesco Bruni, explained: "There were some moments when there were 50° shifts which were 'self-tacking'. It was really hard to read the pressure on the water and to make the compromise between doing too many tacks and gybes and not doing enough. Otherwise the conditions were beautiful and always with plenty of opportunities to come back." In the third race, which they won, Artemis popped out in front at the top mark having threaded her way in on port. As to the reason for Team CEEREF and Peninsula Petroleum doing so well, Bruni reckons: "They don't make big mistakes and they seem able to stay in the top five, no matter what happens and score some bullets now and then. I think Vasco [Vascotto –Peninsula Petroleum tactician] and Ado [Adrian Stead] have been reading the waters better than others here." Improved today, but still not showing their pace-setting brilliance of last season are the Russian boats - Vladimir Liubomirov's Bronenosec Sailing Team and defending World Championship Vladimir Prosikhin's Team Nika, currently fifth and sixth overall respectively. Also going well is Katusha that claimed today's final race – a welcome birthday present for co-owner and helmsman Alexander Novoselov. The final day of the RC44 World Championship Marina de Sotogrande takes place tomorrow. Three races are scheduled starting at 1130 CET.